Does AIPAC rate candidates? You decide. In this hot political season, Ben Smith over at Politico has a juicy scoop today entitled "AIPAC disputes Sestak ad." The gist of the piece is this: one of the campaign ads of Rep. Joe Sestak (D-PA) -- designed, it seems, to fend off criticism that he is anti-Israel, the result of a campaign being waged against him by a group called the Emergency Committee for Israel -- asserts that "According to AIPAC, Joe Sestak has a 100% pro-Israel voting record." Smith's talked to soon-to-be-former-AIPAC spokesman Josh Block, who retorts: "Joe Sestak does not have a 100% voting record on Israel issues according to AIPAC. It couldn't be true, we don't rate or endorse candidates." Now just to be clear, I have no idea how Sestak's record looks to AIPAC, and I don't really care. But during a week when there has been a lot of discussion over what it means to tell the truth in the Israel advocacy world, Josh's words got my attention. Why? Because while AIPAC may not "rate or endorse candidates," it certainly scores their pro-Israel voting (and letter-signing) record. This is well-known on the Hill and among Hill watchers (and is the root of an often-heard question from Hill staff, "do you know if AIPAC is scoring this?"). Continue reading Does AIPAC rate candidates? You decide..
Washington, DC - Americans for Peace Now (APN) is outraged by Israeli Foreign Minister Avigdor Lieberman's speech at the UN General Assembly today. APN welcomes Prime Minister Binyamin Netanyahu's clarification that the speech was not coordinated with him, and that it does not reflect Netanyahu's policy in pursuit of peace with the Palestinians. Continue reading APN Outraged by Avigdor Lieberman's UNGA Speech. Apologies for the late Round-Up -- we are on high holiday schedule at APN (so closed last Thurs/Fri). 4. Ros-Lehtinen Promises House Resolution on "Jewish State"
5. The settlement freeze ends. What about peace talks? Continue reading APN Legislative Round-Up for the week ending September 24, 2010 . The leaders of Hamas in Gaza and Damascus could not have expected a better gift from the Israeli government. Continue reading Ma'ariv OpEd: "A Stranger Wouldn't Understand It" by Peace Now's Yariv Oppenheimer. Details of APN's App and online mapping project spread across the globe during its first week of release. Media coverage included major news outlets like CNN, U.S. and international newspapers/blogs, technology, business, and activism magazines/blogs/websites, Jewish community newspapers and national blogs, and on Israel Radio and NPR. See the links to these items, starting with the Video Screencast from Kung Fu Jew! Continue reading APN's "Facts on the Ground" App - Media and Online Networks Spread the Word. ACTION ALERT: "The settlement freeze ends. What about peace talks?" Last night the Israeli government failed to extend its ban on new settlement construction in the West Bank. This is bad news. Israelis and Palestinians are negotiating over the future of the West Bank. Renewed settlement construction sends a dangerous message about Prime Minister Benjamin Netanyahu's commitment to peace talks. Continue reading ACTION ALERT: "The settlement freeze ends. What about peace talks?". Mideast talks fall apart, as Israel lets West Bank settlements begin anew. Peter Beinart writes on how American Jewish groups tie Obama's hands--and work against peace. Continue reading The Daily Beast: "How U.S. Jews Strangle Peace Talks" by Peter Beinart. 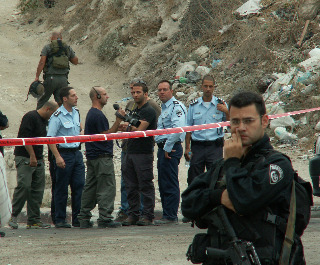 We wrote earlier today about the crisis unfolding in Silwan. The latest Jerusalem news - that the Israeli police have withdrawn from the Temple Mount/Haram al Sharif and the barricaded worshipers have left the site - is creating the impression that this crisis is now behind us. Continue reading Silwan Crisis - Not Over Yet. Listen to NPR's Morning Edition story focusing on APN's newly launched Map Project and iPhone/iPad app. "Now, powerful mapping technology and extensive data are available for the first time for anyone with an iPhone or computer...Peace Now is offering detailed maps showing why Israeli settlements will also derail a two-state solution." Click here to listen. Yesterday the New York Times published an article describing a recent Peace Now flight over the West Bank. Passengers on the flight included Members of the Knesset, journalists, and others, including a famous Israeli playwright named Joshua Sobol, who recently signed onto a letter refusing to participate in performances in settlements. During the flight Sobol made some very harsh comments about settlements. In response, the school where Sobol teaches in Jerusalem (a private religious film school) has suspended him from teaching. Commenting on his suspension, Sobol sounded regretful but stated: "Perhaps the time has come for the controversy over the settlements to come to the surface, and that is my response. And if it costs me this workplace, then I am sorry. But sometimes a person has to go with his truth to the end." Below is the article from Yedioth Ahronoth (Hebrew print edition) detailing the story. Continue reading Israeli playwright suspended from job for criticizing settlements. NPR Report: "iPhone App Monitors Israeli Settlement Building"
"Now, powerful mapping technology and extensive data are available for the first time for anyone with an iPhone or computer...Peace Now is offering detailed maps showing why Israeli settlements will also derail a two-state solution." Go to the NPR website HERE to listen to the 4 minute report. As most people probably know by now, early this morning (reportedly around 4am local time) an Israeli security guard working for the Silwan settlers shot and killed a Palestinian resident of Silwan and wounded two others, one seriously (Haaretz, Ynet, Maan). Continue reading Crisis in Silwan. The founder and executive director of the organization Just Vision speaks about its mission to highlight non-violent efforts to resolve the Israeli-Palestinian Conflict, including its new film "Budrus" to be screened throughout the U.S. in October. The documentary is about the efforts of a man and others from his town and beyond who protest in order to keep their town from being destroyed due to the construction of Israel's security barrier. Continue reading Interview with Ronit Avni of Just Vision. 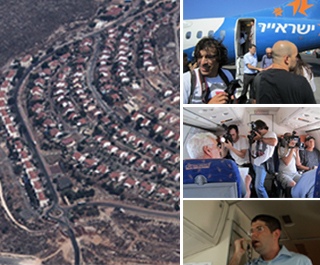 NY Times: "Peace Now Flight Highlights West Bank Settlements"
Detailed coverage in the United States "newspaper of record" about Peace Now's aerial tour of West Bank Settlements, conducted on September 20, 2010, for Members of the Knesset, journalists and other guests. Continue reading NY Times: "Peace Now Flight Highlights West Bank Settlements". Jerusalem Post: "New iPhone application tracks West Bank settlements"
Americans for Peace now releases app which provides a "comprehensive settlements database, integrated with high-tech mapping technologies." Americans for Peace Now has released a new interactive mapping application for Apple iPhone and iPad devices which will provide a real-time view of events on the ground in the West Bank, according to a press release by the organization. Continue reading Jerusalem Post: "New iPhone application tracks West Bank settlements". Q. PM Binyamin Netanyahu has placed the demand for Palestinian recognition of Israel as a Jewish state at the center of his negotiating position. What are the ramifications of this demand for the future of negotiations? Q. US peace envoy George Mitchell went straight to Damascus from the Sharm al-Sheikh and Jerusalem talks of Sept. 14-15 between Israelis and Palestinians, amidst rumors that a major effort would now be made to renew Israeli-Syrian peace talks. Why now? 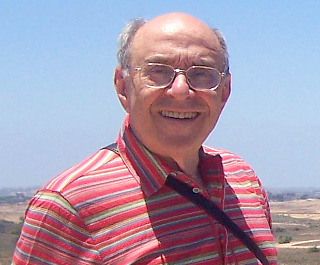 Continue reading Hard Questions, Tough Answers with Yossi Alpher- September 20, 2010. Ha'aretz: "West Bank settlements can now be tracked on your iPhone"
Peace Now releases 'Facts on the Ground' application in which the settlements are marked in blue, the outposts in red, and clicking on a place name displays demographic statistics. Continue reading Ha'aretz: "West Bank settlements can now be tracked on your iPhone". Washington, DC - Americans for Peace Now (APN) is today proud to release a revolutionary interactive mapping tool, which will for the first time give anyone, anywhere, a comprehensive real-time view of what is happening on the ground in the West Bank. Continue reading APN's Mapping Project. 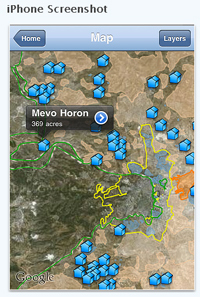 This morning APN is releasing an interactive mapping tool that is going to change the debate about settlements forever. I'm very excited. We've been working on this revolutionary app for close to a year. It is finally ready for you to check out online or on an iPhone or iPad. Settlements stand in the way of peace. In the short-term, news of their expansion can derail President Barack Obama's efforts to get real peace talks going. In the long-term, unchecked settlement expansion can spell the end for Israel as a Jewish and democratic state. But that hasn't stopped settler leaders and other talking heads from spouting empty rhetoric about how construction in settlements doesn't really matter. Their tactic is simple: take advantage of the complexity of the situation to obscure construction that undermines peace. Continue reading Tracking West Bank settlements just got a whole lot easier. Continue reading APN Legislative Round-Up for the Week Ending September 17, 2010. Martin Bresler is the Chair of the Board of Americans for Peace Now. Born in Brooklyn and a life-long New Yorker, Marty practiced law for almost forty years, most spent as a partner of Stroock & Stroock & Lavan. He holds a business degree from City College of New York (Baruch School), and a law degree from Harvard Law School. Marty served in the United States Army before he started his career in law. In recent years, Marty has been APN's representative to the Conference of Presidents of Major American Jewish Organizations, of which APN is a member. Marty is also a member of the Board of Governors of the American Jewish Committee. On August 30th ForeignPolicy.com published my analysis of some of the glib talk that is going on these days about "compromises" on the settlement moratorium -- like Israel building "only" in settlement blocs or allowing only "vertical" construction. Today ForeignPolicy.com published my follow-up analysis, which looks at another suggested compromise - the "de facto" moratorium - and makes the case that a compromise on the moratorium - while possible - is not actually necessary and is not good for Israel. As Israeli and Palestinian negotiators sat down for the second round of peace talks today in Sharm el Sheikh, their meeting was overshadowed by the imminent expiration of the settlement moratorium on September 30th. Many pundits continue to argue that a compromise on the settlement moratorium -- one that permits Israel to pursue some new settlement construction -- is the only thing that can get the parties past this hurdle. Many continue to suggest, too, that a "reasonable" compromise on settlements is easy to define. They are wrong on both counts. It also seems safe to predict that a corollary to these arguments will soon emerge, to the effect that President Abbas' continued refusal to accept a compromise proves he is weak or, more damning, not serious about making peace. The irony is that this analysis makes as much -- if not more -- sense applied to Prime Minister Netanyahu. Continue reading Glib talk about settlements harms peace efforts (Part 2). 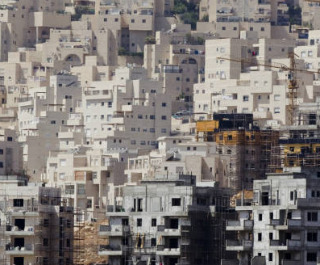 AFP: "Thousands of Israeli settler homes planned"
AP: "Israeli FM pushes for new settlement construction"
Continue reading Articles on Planned Settlement Construction. Questions answered cover: Strategic trends in the Jewish New Year, 5771; The passing of Major General (ret.) Yisrael Tal; Israel Foreign Ministry rejection of a visit by five European foreign ministers; Unusual high-level Israeli visits to Athens and Moscow. Continue reading Hard Questions, Tough Answers with Yossi Alpher- September 13, 2010. 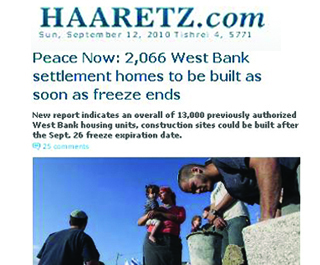 Ha'aretz: "Peace Now: 2,066 West Bank settlement homes to be built as soon as freeze ends"
New report indicates an overall of 13,000 previously authorized West Bank housing units, construction sites could be built after the Sept. 26 freeze expiration date. 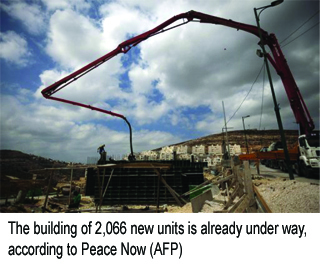 Continue reading Ha'aretz: "Peace Now: 2,066 West Bank settlement homes to be built as soon as freeze ends". Ha'aretz: "MKs, settler leaders fume as PM hints at freeze extension"
Ma'ariv: "Settlers to Netanyahu: Continuation of the Freeze Will Mean an End to Your Term"
Continue reading Articles on Pro-Settler Responses to Possible Freeze Extension. New York Times: "A West Bank Enclave Is on Edge"
ARIEL, West Bank -- When a group of Israeli artists recently refused to perform in the new theater at this large Jewish settlement, local residents reacted with a mixture of hurt and defiance. Continue reading New York Times: "A West Bank Enclave Is on Edge". Washington, DC - Americans for Peace Now (APN) joins its Israeli sister organization Peace Now (Shalom Achshav) in backing the decision taken collectively by dozens of Israeli performers, authors, artists and scholars not to take part in performances at the new cultural center in Ariel, a settlement located in the heart of the West Bank, or in other West Bank settlements. APN also commends American performers and artists who have expressed support for their Israeli colleagues. Continue reading APN Backs Israeli Artists who Refuse to Perform in Settlements. Jerusalem Post: "Oren urges Jewish leaders to support peace moves"
WASHINGTON - Israeli officials are indicating that they anticipate a backlash from the American Jewish Right over the government's overtures to the Palestinians, and are appealing for support from US Jewry. Continue reading Jerusalem Post: "Oren urges Jewish leaders to support peace moves". APN is pleased to be holding a brunch in honor of Martin Bresler on Sunday, October 3, 2010 at 11:00 am at the Egremont Country Club in Great Barrington, MA. Continue reading Brunch to Honor Martin Bresler, APN Board Chair. 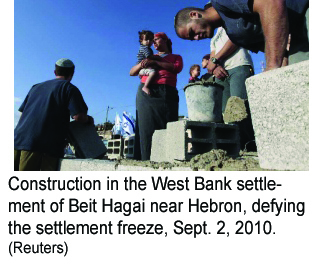 4-minute report from Morning Edition on September 7, 2010 on Israeli-Palestinian peace talks running up against the challenge of the settlement construction moratorium. Listen here. 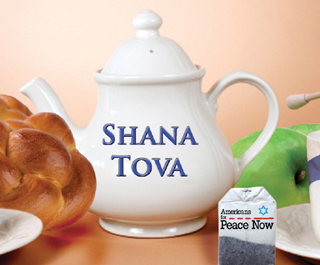 Continue reading A Sweet New Year, Steeped in Peace, from APN. NPR Report: "Israeli Foreign Minister Touts Settlement Building"
Go HERE to listen to the 4-minute report from Morning Edition on September 7, 2010. (Transcript) STEVE INSKEEP, host:The Israeli-Palestinian peace talks that started last week are quickly running up against a challenge. A deadline is approaching for Israels government to make a decision. And that decision could prompt Palestinians to walk out of the talks. Continue reading NPR Report: "Israeli Foreign Minister Touts Settlement Building". Alpher answers questions about the beginning of direct peace talks last week, and about the Israeli artists' boycott of a new cultural center in the West Bank settlement of Ariel. Continue reading Hard Questions, Tough Answers with Yossi Alpher- September 7, 2010. MR. CROWLEY: Good afternoon and welcome to the Department of State in Washington, D.C. Today, we have successfully re-launched direct negotiations between the - among the United States, Israel, and the Palestinian Authority in pursuit of a final agreement, a final settlement and a just peace, two states living side by side. George Mitchell will give a statement and answer a few of your questions, but we still have meetings going on with the parties and will have - he'll have to return upstairs rather rapidly to rejoin the negotiations. But here's Senator Mitchell. MR. MITCHELL: Good afternoon, ladies and gentlemen. The parties have just concluded the first round of trilateral talks. The meeting lasted about an hour and a half. It began with a plenary session involving the full U.S., Israeli, and Palestinian delegations on the eighth floor of the State Department and then broke to a smaller meeting in the Secretary of State's personal office involving Prime Minister Netanyahu, President Abbas, Secretary Clinton, and myself. Prime Minister Netanyahu and President Abbas then went into a separate meeting for a direct discussion. That meeting is still going on right now. Continue reading Transcript of Mitchell's Press Briefing on Start of Direct Talks. SECRETARY CLINTON: Good morning and welcome to the State Department here in the Benjamin Franklin Room. I want to thank all of you for joining us today to re-launch negotiations to end the Israeli-Palestinian conflict. I know the decision to sit at this table was not easy. We understand the suspicion and skepticism that so many feel, born out of years of conflict and frustrated hopes. The tragic act of terror on Tuesday and the terrorist shooting yesterday are yet additional reminders of the human costs of this conflict. But by being here today, you each have taken an important step toward freeing your peoples from the shackles of a history we cannot change, and moving toward a future of peace and dignity that only you can create. So, thank you. Thank you for your courage and your commitment. Continue reading Full text of Clinton, Netanyahu, and Obama remarks at launch of talks. Earlier this week (just in time for the start of peace talks in Washington) the Israeli Central Bureau of Statistics (CBS) released data (English and Hebrew) regarding construction in settlements (and inside Israel). These include numbers for 2006-2009, the first quarter of 2010, and estimated numbers for the second quarter of 2010. Much has been made of the fact that the data show virtually no new settlement starts in 2010, with the CBS reporting only 2 starts in the first quarter of 2010 and 3 in the second quarter. However, this is not tell the whole story. The key fact missing from such analysis is this: so much new construction was front-loaded just before the start of the moratorium that if the moratorium is not extended past Sept 26th its impact will have been minimal. Continue reading The Neglected Facts within (and omitted by) the Latest Settlement Stats. Continue reading Pre-Dinner remarks: Obama, Mubarak, Abdullah, Netanyahu, and Abbas. Continue reading Remarks by the President in the Rose Garden after Bilateral Meetings. Continue reading Readout of President Obama's Meeting with King Abdullah of Jordan. Continue reading Secretary Clinton Hosts Re-Launch of Direct Israeli-Palestinian Negotiations September 2 (remarks to be live-broadcast). Many people have asked me what I think about the Israeli-Palestinian peace talks that open today in Washington. My answer is twofold. First, I'm excited. Today, the leaders of Israel and the Palestinians will sit down to negotiate peace, face to face. And they will do so under the auspices of President Barack Obama, who clearly is committed to achieving peace. Make no mistake: It's a big deal that Prime Minister Benjamin Netanyahu - head of the most hard-line coalition in Israel's history - is coming to the table to negotiate a two-state peace deal. And it is a big deal that President Mahmoud Abbas is coming to the table with the explicit backing of the entire Arab world. This is a moment to be savored. It's a sign that our message - that negotiations are the only way to make peace for Israel - has had an impact. Continue reading APN's Debra DeLee on today's peace talks. Continue reading Post-Obama/Abbas meeting - Report from White House pool reporter . September marked the beginning of the first direct Israeli-Palestinian talks since President Barack Obama took office. APN is providing up-to-the-minute news and analysis as events unfold. Look here for a list of resources. Continue reading Direct Israeli-Palestinian Peace Talks Open. Continue reading Obama/Netanyahu remarks after today's bilateral meeting. Tomorrow marks the beginning of the first direct Israeli-Palestinian talks since President Barack Obama took office. There are good reasons to be skeptical that these talks will succeed, and the reasons for skepticism are clear: the readiness and ability of both Israeli and Palestinian leaders to deliver their respective sides of a peace agreement is in doubt; President Obama has yet to demonstrate the kind of hands-on, "I-will-not-let-this-fail" engagement that will be necessary for talks to succeed; and of course, spoilers will be out in force, seeking through actions and words to provoke hatred and anger, to undermine trust, and, if possible, to destroy this new peace process. That said, there are also reasons to be hopeful that these talks can succeed. With most attention these days focused on the reasons for skepticism, we think this is an important time to look seriously at these reasons for hope. Continue reading Top 10 Reasons to be Hopeful about New Peace Talks. Continue reading Special Envoy Mitchell's Press briefing 8/31/10. Continue reading SecState Clinton/Bibi Remarks, 8/31/10.